There is a tremendous body of research indicating the significant health benefits of microgreens. In 2012, a team of researchers found that "in comparison with nutritional concentrations in mature leaves, the microgreen cotyledon leaves possessed higher nutritional densities." Since then, numerous teams of researchers have conducted trials scientifically validating and expanding on the health claims that have been made for decades about sprouts and microgreens. Brassicas (e.g., broccoli, kale, cabbage) in particular have received an enormous amount of attention due to their high concentration of a chemical compound sulforaphane. In numerous peer-reviewed, double-blind, and placebo-controlled studies, sulforaphane has been shown to have anti-cancer and anti-inflammatory effects. Sulforaphane has also been proven to alleviate symptoms associated with autism spectrum disorder. One ounce of the Arizona Microgreens Wellness Mix (consisting of broccoli, cabbage, and kale microgreens) contains the amount of sulforaphane found in 1.5 pounds of raw broccoli. - Sulforaphane "raises the activity of (phase 2) enzyme systems that detoxify carcinogens." - “Supplements confer little advantage (over raw broccoli). Fresh vegetables provide a higher content of vitamin C, folic acid, and fiber, and a balance of phytochemicals that favor overall protection against carcinogenesis. The full range of nutrients contained in (whole) foods must be present to detoxify carcinogens"
- "Breast cancer is initiated from and maintained by a small population of breast cancer stem cells." - "Currently available chemotheraphy and radiation therapy are incapable of suppressing cancer stem cell population." 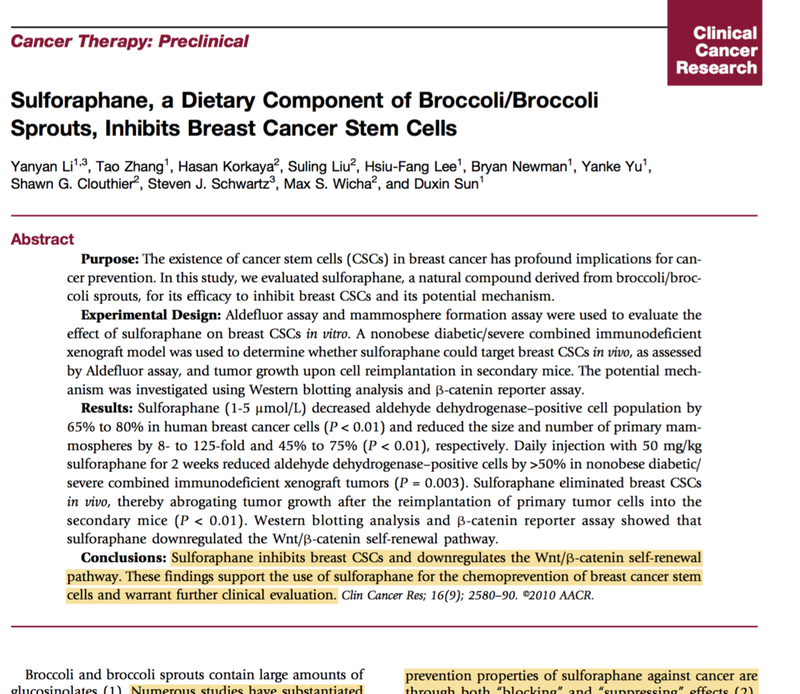 - "Sulforaphane inhibited breast cancer stem cells in vitro." - "Sulforaphane eliminated breast cancer stem cells in vivo." 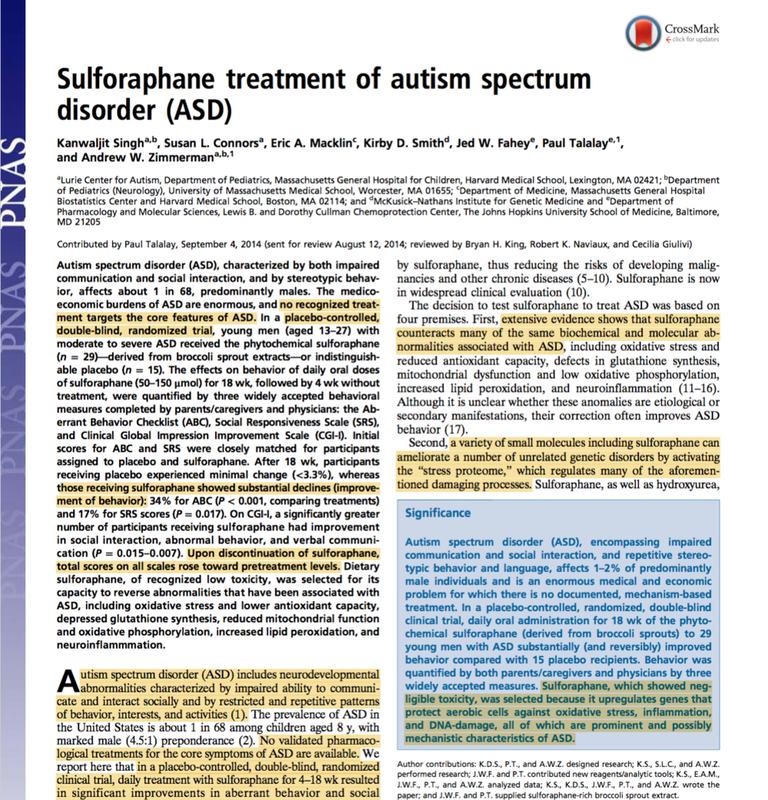 - In a placebo-controlled, double-blind, randomized clinical trial, daily treatment with sulforaphane for 4 - 18 weeks resulted in "statistically significant and clinically meaningful improvements" in participants diagnosed with moderate to severe autism. - "Sulforaphane was selected for the trials "because it up-regulates genes that protect aerobic cells against oxidative stress, inflammation, and DNA-damage." - "The effects of sulforaphane supplementation appear clear and powerful to many caregivers. Their reports are striking." - "He was calmer, seemed happier, less stressed. His focus was improved. His group home manager had the same comments." "He is more social and goes to concerts, movies, restaurants, and family outings (all of which were not possible before the study." - Overview, with citations, from Dr. Axe of what sulforaphane is and the scientific research to date on its anti-cancer, detoxifying, and other benefits. - Overview, with citations, from Dr. Mercola on the mechanisms behind the chemoprotective properties of sulforaphane. Do microgreens really have more nutrition than full leafy greens? Michael Gregor, MD weighs in on a recent study by USDA researchers: "Microgreens [possess] significantly higher nutrient densities than mature leaves. For example, red cabbage microgreens have a 6-fold higher vitamin C concentration than mature red cabbage, and 69 times the vitamin K. Microgreens are definitively more nutrient dense." Worried about the shelf life of microgreens? Don't be. Just throw them in the freezer and use them in a green smoothie. Research has shown that freezing broccoli sprouts had no adverse effect on sulforaphane content. In fact, "freezing at -20 °C increased sulforaphane yield by 1.54 - 2.11 folds."